PBOT Project Manager Scott Cohen at the kickoff planning meeting September 20th. Making good on a promise made over a decade ago, the City of Portland has finally started planning a new bikeway on NW Flanders between Waterfront Park and 24th. And at a meeting late last month, Portlanders got their first chance to see it. The origin of the project goes back to the 2005 Burnside/Couch Transportation and Urban Design Plan. As the legend goes, bike advocates cut a deal with the Bureau of Transportation: Couch was originally designated as the major east-west bikeway through this part of town; but PBOT wanted it to be the couplet with Burnside, so the agreement was to switch the bikeway a few blocks north to Flanders. The plan was adopted. The couplet was never completed and the Flanders bikeway was all but forgotten. PBOT has already built around 80 miles of neighborhood greenways, but those are in residential areas. The Flanders bikeway would be a different animal since it would have a more dense and urban context. 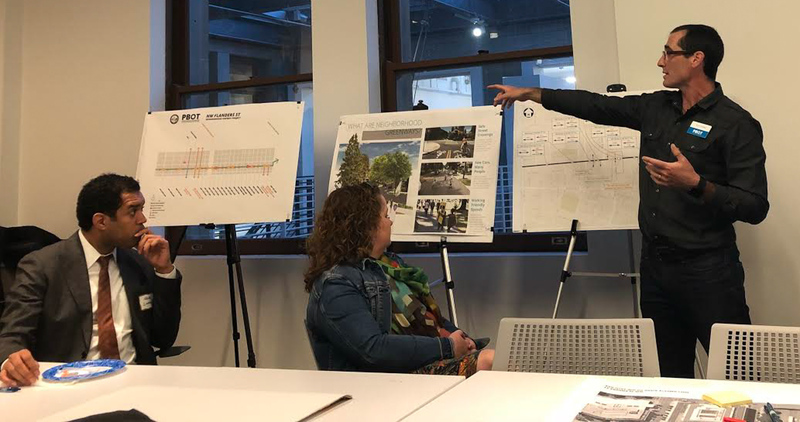 Pearl District Neighborhood Association member and safe streets advocate Reza Farhoodi was at the project’s kickoff meeting last month. He said he was “impressed” with the initial proposals — especially in Old Town and the Pearl. Farhoodi shared an image of PBOT’s project map that lists existing auto traffic volumes and traffic diverters proposed along the route. 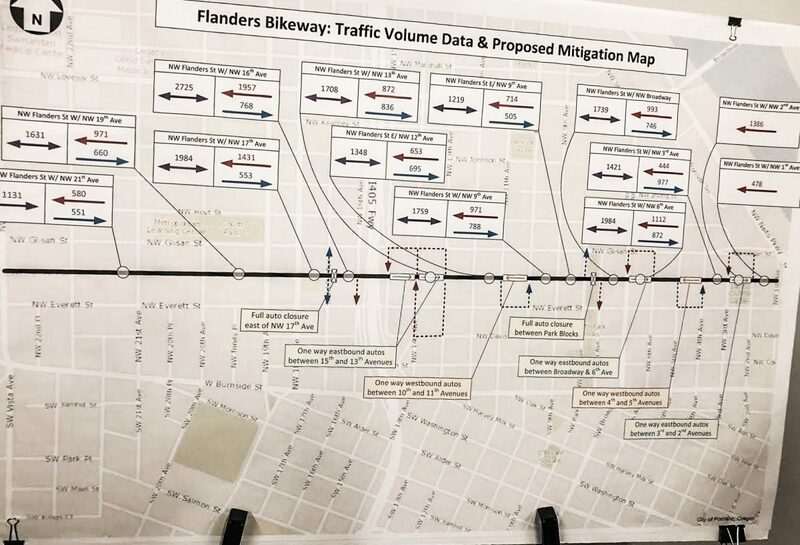 The map (below) shows that PBOT wants to implement significant measures to reduce the number of people who drive on Flanders. The map shown at the meeting. PBOT’s greenway design mandate (as adopted by City Council with the 2015 Neighborhood Greenways Assessment Report) is to get the number of people driving cars to about 1,000 per day. As you can see on the map, the average daily traffic (ADT) on Flanders today is way above that. To discourage driving on Flanders they’ve proposed alternating one-way sections and two full driving closures: one at the North Park Blocks and one just east of 17th. One sticking point that remains is the crossing of Naito just south of the Union Pacific Railroad tracks at the Steel Bridge. PBOT has spent years negotiating with UPRR to make a crossing at this location and now they have a design and the funding to make it happen. But PBOT Project Manager Scott Cohen made it clear at the meeting last month that UPRR is still not satisfied and there are interim plans to jog the route to NW Davis to get across Naito until a final plan for a crossing at Flanders can be ironed out. We’ll be watching that part of the project closely. Expect more public outreach in the coming weeks and months. PBOT expects to have a final design completed by next spring. Correction, 10/9: This post originally said that the West Burnside/Couch couplet was built. That was a mistake. The couplet was never built (it was on the east side, however). Any designs for the 405 bridge yet? Where is this NW Burnside-Couch couplet you speak of? I guess that ship sailed. Too bad, I think a couplet would be great. Imagine Burnside with the wide tree-lined sidewalks that eliminating one direction of traffic would permit. We could have our own Las Ramblas. what do you mean paikiala? I think he’s pointing out that the couplet was never built on the west side of the river. Only the inner eastside got the couplet treatment (one-way on Burnside, one-way on Couch). Perhaps PBOT has finished designing the westside Burnside/Couch couplet and have been “about to implement it” for the last 6 years, like the East Portland projects they’ve designed, funded, but never actually quite got around to building. In East Portland, PBOT would frequently tell us a project was already built when in fact nothing was put into the ground, but they had nevertheless spent the whole budget on design and public outreach, with a work-order to implement what’s needed on July 41st 2037. The W Burnside-Couch is in the recently updated Transportation System Plan, but weirdly everybody at PBOT acknowledges there’s zero intent left to ever build it. The Westside couplet Burnside bridge to 17th has never been funded or built. The East side couple was part of the redesign of the 11th,12th,Sandy, Burnside intersection. This five way intersection, for decades, was the most dangerous in the city and was a completely different project unconnected to the Westside plan. The Westside plan, with the new CCIM plans for west Burnside and the Burnside bridge, will be replaced with actual bike facilities instead of angled parking assuming CCIM is adopted by council. E Burnside and NE Couch west of NE 16th are a couplet. But I know of no such couplet on the west side, so I don’t see why that prevented the bike overpass over 405. Totally agree with Reza about the Flanders vs Davis crossing. If it ends up being Davis, it’s going to really be sub-par as a corridor through to the Steel Bridge. The jogging to the south to Davis is already a pain. I’ve got my fingers crossed that the railroad will be collaborative, but I’m not exactly hopeful. If it does pan out, this is a fantastic project. Placing the bikeway on Flanders is more elegant than Burnside or Couch. One of my big hopes is PBOT does away with stop signs every-other block on key bikeways. Riding up or down Johnson is a joke, and that kind of placement on a “key” bikeway just invites people to break the rules. I agree, I hate having so many stop signs on my greenway, except…….the stop signs discourage drivers from using Johnson, and they make it more difficult for drivers to get their speeds up. I mean, the real solution would be car-free routes. The halfway solution is a janky road in disrepair with faded sharrows and lots of stop signs. I still prefer the halfway solution to riding on Glisan. like they have at every neighborhood greenway/legacy upgrade? PBOT hasn’t yet done any upgrades to neighborhood greenways in dense urban areas like Old Town / the Pearl / Northwest. Almost every street that intersects Flanders has an equal or higher design classification, so the strategy that works well in the suburban style neighborhoods probably won’t work on Flanders (i.e. there’s no chance that PBOT is going to flip the stop signs at 10th and 11th where the streetcar crosses Flanders). One strategy that could be used at un-signalized intersections is to require users to yield but not stop. We don’t seem to do that much in Portland, but that’s standard practice in Europe. SE 71st Ave as it approaches SE Tolman Greenway from both north and south directions features Yield signs. It is such a rare design choice here that I do a double-take everytime I pass by. I’m not clear on the Naito crossing. Why does that require UPRR? I know that the crossing project included improvements to the tracks crossing (moving the Willamette Greenway crossing), but it seems like that could be delayed while proceeding with the Naito crossing. Gary, I think it’s because the bike signal needs to be coordinated with the at-grade rail crossing. They would need to communicate with each other. If the bike signal stopped auto traffic, the rail line would not want autos stacked across the tracks for safety reasons. My guess is that this makes things more complicated for the rail line and, consequently, makes rail less interested in making modifications to its system. That’s not how it works. Just as ODOT has an “influence area” around interchanges where they have veto power, UPRR has an influence area around railroad crossings. Also the railroads are widely recognized to have more power than local governments in many ways, since they existed first and were granted their right-of-way by the federal government. 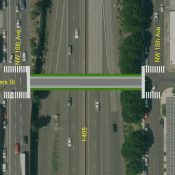 I hope they address the cut-through traffic from people coming off 405 southbound and go Flanders-18th-Glisan. That is an illegal move, drivers ar supposed to drive Everett-15th-Glisan, but it is not enforced, and the light at 15th/Glisan is a long red and a short green. Anyway, that kind of cut-through traffic can ruin a greenway. Why is it illegal? I see people turn directly on Glisan from the 405 offramp, which is illegal (requires turning across multiple lanes). But you can legally get over and turn on Flanders, I think. 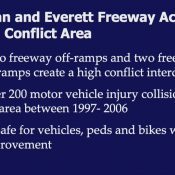 I recognize there’s a sign telling directing drivers to use the Everett loop, but that’s just an advisory sign. I agree it should be addressed for the Greenway (or sooner). It is illegal because it requires crossing multiple lanes within a block. It would be great if the bike lane on 2nd was extended between Everett and Flanders, Biketown could move to the other side of the street and take a few parking spots. Yes Greenways are the answer, separate from commuter traffic, don’t mix bikes with commuters. The current lack of an clear, safe link between the Steel Bridge and Old Town is a real problem for the downtown bike infrastructure. 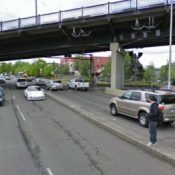 Trying to cross Naito near the railroad tracks is a dangerous exercise in curb hopping, traffic dodging, and going the wrong way on one-way streets. The Flanders crossing is key to linking the east and west sides of the river. So what happens to Everett right next door? 2 Bikeways? Sure, two bikeways, why not? One has a green wave with the signals, the other one is quiet and comfortable. Different strokes for different folks. Flanders is designed for all ages and abilities and will likely have a moderate pace. Everett is not: I would not let me eight year old nephew ride there. It is best for fast cycling commuters. 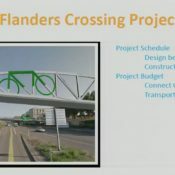 Flanders will be frustrating if crossings at busy streets are left to chance. I used to ride down Jefferson from 25th to the Steel Bridge before Everett was striped. Getting across 23rd, 21st and 14th were significant tests of patience. Yeah, I guess I’m doomed to ride over the center divider and go the wrong way up Glisan even after this is built. I’m understandably disappointed that the most important connector isn’t on the table, but I’m glad the rest of it is being built.